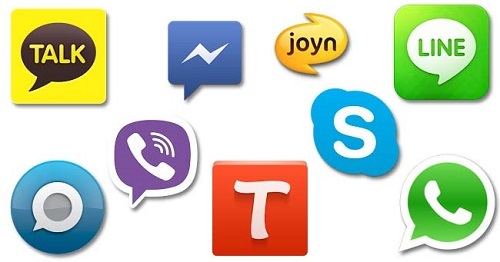 Top 10 Free Chat Apps for Android and iPhone. Ever since the booming app era started, SMS messenging is becoming a less and less used method of communication. Chat apps, that are only getting more popular, offer MMS, group chats, face to face video calls, games and even more. We can call these SMS+ apps. This is basically what the are as they are a means of communication just without revealing your phone number. That’s also why these apps are becoming so popular to communicate with. You can share your user name on one of these apps and talk with someone without giving out your personal phone number or your real name. There are so many apps out there to choose from and you won’t know which one is the best fit for you until you try. Your friends might like one more, than what works best for you. To help you out, we are going to go over the most popular chat apps, that you can easily download right now, for free. The Top 10 Free Chat Apps. Most of the apps are also available for Apple IOS Iphones and Windows phones. Snapchat has been taking everyone by storm these days. It is honestly probably the most popular chat app at this moment. Because it isn’t a traditional chat app, this is what makes it so unique and why it has so many users around the world. The deal with Snapchat is this; you take a picture or record a video, add an optional caption and send it to all or only some of your friends. Your friends can then screenshot the picture if they want to keep it as a memory because here’s the catch; people are only allowed to view personal messages for a short period of time. Aside from that, Snapchat features SMS type messaging through their app. These messages also disappear after some time has passed. Snapchat is so popular these days and you can see the personal lives of your favorite celebrities through their Snapchat stories. These are snaps you take and share with anyone who is friends with you or following you on Snapchat. This app does a good job at maintaining mystique because of how everything disappears within a certain amount of time. Never tried Snapchat and want to? Download the app today! Whatsapp is one of the most popular messaging apps out there. Talk to your friends and family in real time as well as leave voice messages. Let people know where you are, like if you’re at the coffee shop, and they can see that and meet you up! How cool is that? Share media such as videos or pictures. Android Wear support is also provided so you can use the app through your watch. If Whatsapp seems like your kind of app, check out the app right now. Of course Facebook’s messenger would be the biggest chat app ever. Facebook is super popular and they make it easy to talk to anyone who may be logged onto Facebook at the moment. Share pics and vids and don’t forget to try out the voice calls. Easily start group chats and get the full benefits from Facebook Messenger for free. Install this app to ensure that your messages are sent fast and securely. Telegram is relatively easy to use for the average phone user. It is featured to be highly secure and super quick. This is the main reason it’s a pretty popular chatting app. As a popular chatting app, WeChat should definitely be considered. Support for Android Wear is there so you can use your high tech watch to manage messages. Send messages from your PC as well with WeChat. Free video calls are also included! Signal is good for the person who prioritizes security. The ability to end encryption and a group chat feature allows you to do just what you need to communicate with friends, family or even coworkers. BlackBerry Messenger is popular with BlackBerry users. Create group chats with ease and limit the amount of time someone has to view a message kind of like Snapchat. Free unlimited voice calls are available for you to make whenever you want to any BBM contact on your list. Line is one of the largest apps for chatting out right now. Line gives you group chat features, as well as 1 on 1 chatting. Line contacts are also allowed to have free video calls and voice calls anywhere in the world. There are fun icons and stickers you can put in your message to enhance conversation. This easily makes your chats fun and interactive. Don’t forget that you can use this on your computer as well, that’s convenient! Google Hangouts is one of the most famous apps for chatting. It can be accessed by phone, tablet, computer, etc. You will never have to worry about losing contact wherever you may be. You can have one on one hangouts, as well as group hangouts. Make video calls and use exclusive Google stickers and emojis. Google Hangouts also supports gifs which is nice. Group me is primarily focused on group messaging. Chats with only one other person is also available. Emojis are usable and there are advanced packages you can buy which offer more options. Groupme is accessible from either the app or the website so you can send messages sitting from your computer. Well, there you have it, the top 10 free chat apps for android. They all are great in their own way. Some have certain features that others don’t and the best chat app for you is going to depend completely on your preferences. These apps were meant to optimize your communication experience as well as make it easy to have conversations without giving out your personal phone number. We hope these free chat app reviews assisted you in choosing what app you would like to test out! Already using several apps from this list like Facebook Messenger, Line, Telegram, WhatsApp etc.